Whoa! I just made this by accident! This is a recipe I make frequently, but I usually use regular quinoa and not black quinoa.... so it looks normal. As I was mixing in the edamame a light bulb went off! Monster Mash Quinoa was just born. Perfect for fall festiveness, indeed. It looks pretty creepy I must say, but it tastes good & is good for you! Prepare quinoa according to package directions, and additionally adding vegetable base (follow directions for the amount of water you are using). 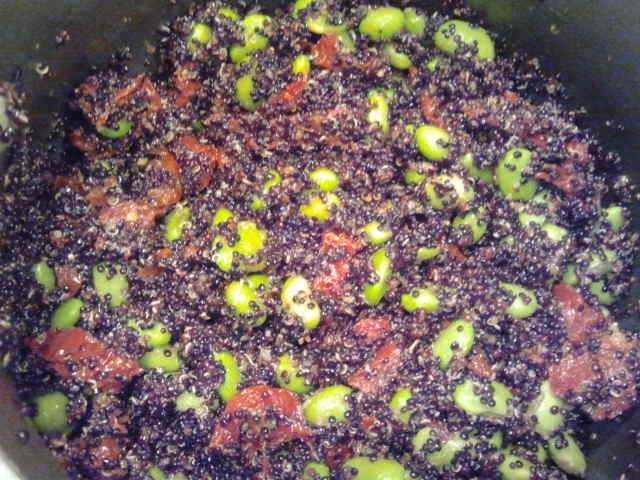 Once quinoa is done cooking add edamame and sun dried tomatoes with oil. Season as desired. Serve and spook! Amazing!! AND, fast, easy and cheap! Holy awesomeness!!!! This is the easiest, cheapest, fastest, hands-down most awesome Halloween idea EVER! I saw a reference for using B Complex vitamins in a drink to make it glow, so I tested it out before "game day". Wow! This stuff really works like magic. This bottle found at Walmart, contains 10 pills for a whopping 88 cents!!!! You can clearly tell in the picture above this juice is glowing! Note, there is a black light on the table behind it. So, we have learned that the "B Complex" vitamins are black light sensitive. Hey everyone! I'm super excited about this project. It worked out so well and I took tons of pictures along the way. Part 1 includes all the base work of cutting out your design through getting the headboard completely covered in batting. Part 2 to follow will include covering your headboard in fabric and adding any desired trim (mine will have brass nail heads). 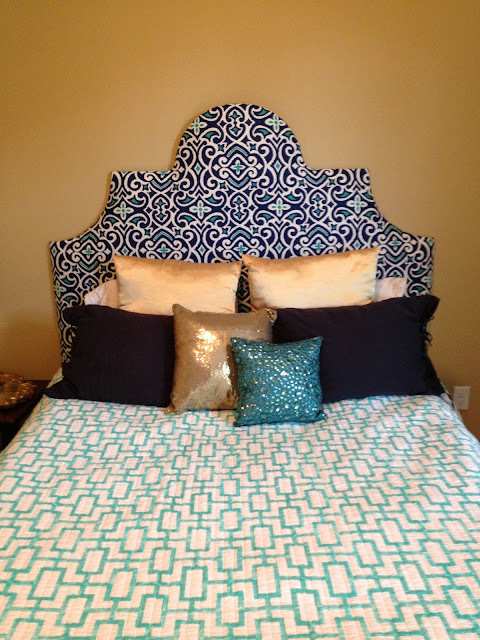 I've seen quite a few tutorials on Pinterest showing how to use plywood to make a headboard. Let me tell you, this way is not dramatically different, and when you have an excess of cardboard is pretty alluring and way cheap! This headboard will be going in one of our guest rooms, so I don't intend on it having lots of wear and tear. I may back it with plywood in the future if I see problems, but for now I think it's pretty darn great how it is. To keep it semi-simple, I'll show you the pictures of the steps with brief descriptions along the way.